One of the most significant things you can do when attempting to conceive or while pregnant is to make sure to be fueling yourself, and your unborn child, with a nutritious diet. Pregnancy is taxing on the body and it is often hard or near impossible to obtain all the recommended nutrients without vitamin supplementation. Making smart choices concerning what you eat and the supplements you take will promote healthy development and growth of your baby says Certified Nutrition Specialist and Innerzyme founder, Katie Jodscheidt. One vitamin that is gaining more and more interest is vitamin K2, which is found in fermented foods such as natto and certain cheeses, eggs, meat, butter and other dairy foods1 from grass-fed sources. However, just because a food is fermented does not necessarily mean it is rich in vitamin K2, in fact, many are not. Many Eastern cultures consume fermented soybeans or natto on a daily basis, however, the slimy and smelly taste and texture of it is often too unpleasant for the Western palate. As far as other foods containing vitamin K2, getting an adequate amount is not as easy as one may think since many foods are lacking this essential nutrient because they are processed, genetically modified and no longer sourced from grass-fed animals. An easier and more convenient way of getting an adequate amount of vitamin K2 is through daily supplementation. However, not all vitamin K2 supplements are created equal. When choosing a vitamin K2 supplement, quality, dosage and type of vitamin K2 is important. The optimal quality of vitamin K2 is in the natural form of MK-7 because it has a longer half-life, meaning it stays in your system longer and the body better absorbs it. In healthy individuals, research has not reported any side effects, adverse reactions or known toxicity as a result of large doses of vitamin K2. In fact, many Eastern cultures consume 300-600mcg of natto daily. Inside the human body vitamin K2 is involved in many processes that are critical for a healthy pregnancy and baby, such as blood coagulation, bone metabolism and other calcium dependent events. Research into the health benefits of vitamin K2 is still in its infancy with more and more work being done. Two recent peer reviewed studies provide encouraging results concerning the role of vitamin K2 in embryonic development. In August 2014, a cohort of Japanese researchers discovered that an enzyme called UBIAD1, which is involved in vitamin K2 synthesis, is required for development of mouse embryos2. When the scientists deleted both copies of the gene coding for UBIAD1 mice embryos died in less than 8 days after ceasing to grow, and as expected, produced no vitamin K2. Strikingly, when the mothers of these mutant mice were administered vitamin K2, the embryos lifespan was extended to term. Not long after this report was published, Canadian researchers found that vitamin K2 supplementation significantly improved embryo production in cows3. This finding is most likely due to the role of vitamin K2 in mitochondria function, which converts sugars into energy for the cells to use. Together, these reports add to the increasing knowledge researchers at Innerzyme are gaining concerning the health benefits of vitamin K2 and warrant further research. Recommended dosage: Take 1 vegetarian capsule (300mcg) per day, or as directed by your healthcare practitioner. Vitamin K2 is essential for calcium-dependent processes in tissues throughout the body, including bone. Since the discovery of vitamin K in 19351 researchers have elucidated many important roles and sources of vitamin K2. 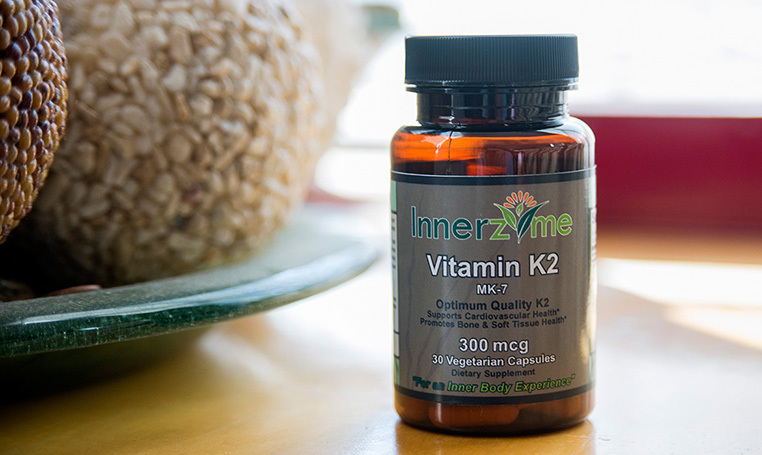 Even though many research milestones have been realized with vitamin K2, the researchers at Innerzyme continue to study this incredible nutrient to gain additional knowledge; including how it enters the body and moves throughout cells and tissues, how it is stored and how it is metabolized2. A major nuance of studying the role of vitamin K2 in the human body is that it is present in relatively low levels, making it hard to detect and measure. All this being said, a number of recent reports from diverse research groups have found promising results related to vitamin K2 and bone health, particularly in postmenopausal women. A recent peer reviewed study from the Netherlands sought out to determine the effects of a natural form of vitamin K2, menaquinone-7 (MK-7), in postmenopausal women3. This work was driven by the European Food Safety Authority’s acceptance of claims that vitamin K had a role in bone health. To test this, the researchers carefully designed their double blind and randomized experiment, in which they measured bone mineral density before the treatment, as well as 1, 2 or 3 years after taking the vitamin K2 supplement daily. Bone mineral density scans are used to estimate the strength of an individual’s skeletal system, a fairly common test for postmenopausal women. Moreover, they looked for fractures and determined vitamin K status throughout the study. In all, the study finished with 223 women, with roughly half the participants receiving MK-7 (180 μg) and the other half receiving a placebo, serving as a control or baseline for the experiment. Within the first year of the supplementation study, maximal levels of circulating vitamin K were achieved, being maintained throughout the 3-year duration. 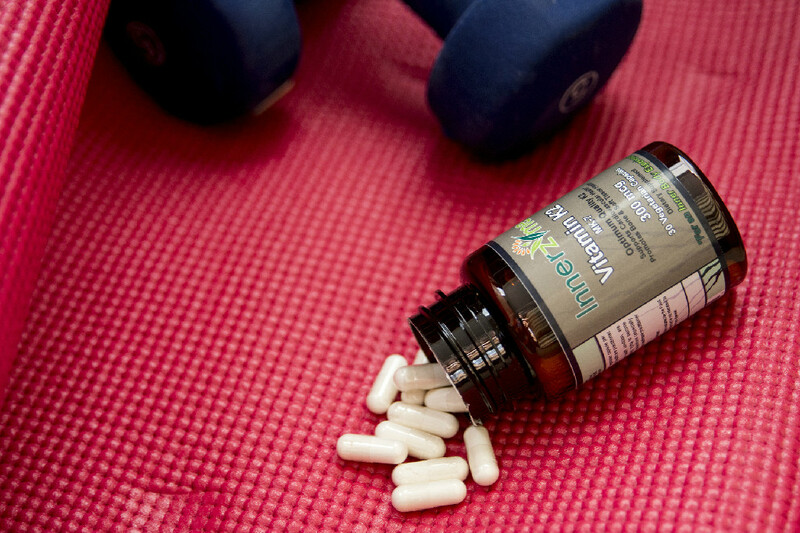 When examining the effects of vitamin K supplementation on bone loss, a pattern of improvement was achieved between year 1 and year 2, but it wasn’t until year 3 that there was a significant benefit for all three bone areas analyzed. In terms of bone strength, the femoral neck was significantly stronger with supplementation. These results support the original claims that drove this work, providing strong evidence of the long-term benefits of vitamin K on bone health. Prior to this study, only two other one-year studies were done on vitamin K2 MK-7.4,5. These encouraging results with the natural form of vitamin K2, MK-7, are most likely due to its chemical properties, including its increased stability and higher potency, compared to other forms. Altogether, this research provides well-documented results that contribute significantly to the growing knowledge base concerning the health benefits of vitamin K2 supplementation, including increased bone health. For healthy bone and soft tissue support, the recommended dosage of vitamin K2, MK-7 is 300mcg per day, or as directed by a licensed healthcare practitioner. In healthy individuals, research has not reported any side effects, adverse reactions or known toxicity as a result of large doses of vitamin K2, MK-7. Dam and Schønheyder, “The occurrence and chemical nature of vitamin K” Biochem J 30(5):897-901 (1936). Card et al., “Vitamin K metabolism: Current knowledge and future research” Mol Nutr Food Res 58(8):1590-600 (2014). Knapen et al., “Three-year low-dose menaquinone-7 supplementation helps decrease bone loss in healthy postmenopausal women” Osteoporos Int 24(9):2499-507 (2013). Emaus et al., “Vitamin K2 supplementation does not influence bone loss in early menopausal women: a randomised double-blind placebo-controlled trial” Osteoporos Int 21:1731-40 (2009). Kanellakis et al., “Changes in parameters of bone metabolism in postmenopausal women following a 12-month intervention period using dairy products enriched with calcium, vitamin D, and phylloquinone (vitamin K(1)) or menaquinone-7 (vitamin K (2)): the Postmenopausal Health Study II” Calcif Tissue Int 90:251-62 (2012). What doctors are saying about Innerzyme Vitamin K2, MK-7? Scottsdale, AZ – Innerzyme, a highly reputable and fast growing nutraceutical company specializing in natural digestive and systemic enzyme supplements has launched the highest potency, Non-GMO Vitamin K2, MK-7 supplement on the market which provides 300 mcg in a single vegetarian capsule. Innerzyme utilizes a pure, optimum quality Vitamin K2, MK-7 as menaquinone-7 from Non-GMO fermented soybeans. The decision to formulate and launch a high potency Vitamin K2, MK-7, 300mcg supplement came after much research into health and dietary habits of Eastern cultures and collaboration with a strategic team of healthcare professionals who focus primarily on preventative care through alternative medicine. The K group of vitamins includes Vitamin K1 and Vitamin K2. It is important to know that Vitamin K1 and Vitamin K2 not only come from different sources but also have different functions. Vitamin K1 is readily available in plant-based foods and easy to consume. 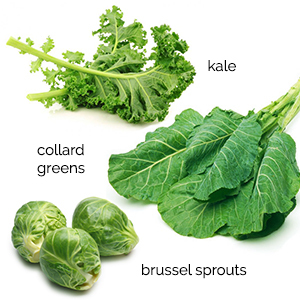 The best way to get an adequate amount of Vitamin K1 is through your diet. Vitamin K1 offers adequate blood clotting support, however, there are a variety of health related issues that Vitamin K1 does not sufficiently support. * (2) Studies show these growing health issues are better addressed by Vitamin K2 in the natural form of MK-7. Although many people in Eastern cultures consume fermented soybeans, the slimy and smelly taste and texture of them often make it too harsh and unpleasant to consume. With the growing research on the many health benefits associated with Vitamin K2, MK-7, Innerzyme wanted to offer an easier and more convenient way for people to get an adequate amount of MK-7. This new addition to the Innerzyme line of natural supplements has done just that with an easy to swallow, one a day vegetarian capsule providing 300 mcg of Vitamin K2, MK-7. Innerzyme is dedicated to improving the overall quality of life for people by spreading awareness about the importance of preventative health and living a healthy lifestyle through proper diet, exercise and nutritional supplementation. Innerzyme is committed to providing people with safe, natural and effective products. Innerzyme supplements are manufactured in the USA to the highest standards in a cGMP certified facility. **Warning: If you have a health condition, are pregnant, nursing, lactating, trying to become pregnant or taking any medications (especially anticoagulants such as warfarin), consult your healthcare practitioner before using this product.